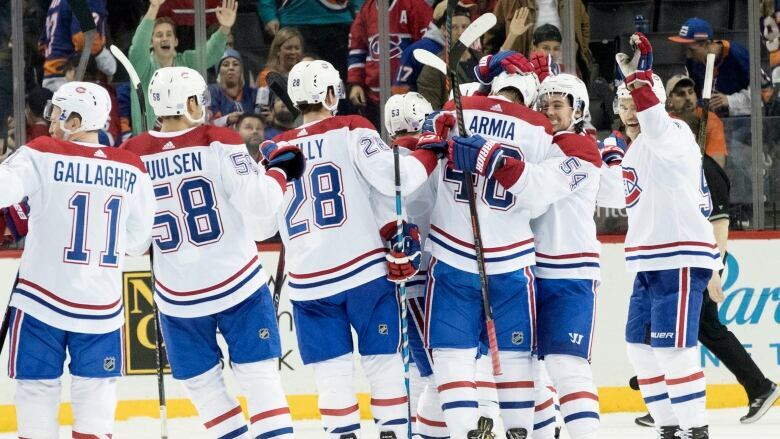 Joel Armia scored in the fifth round of the shootout to lift the Montreal Canadiens over the New York Islanders 4-3 on Monday night. After his team's first four skaters in the shootout couldn't beat goalie Thomas Greiss, Montreal Canadiens coach Claude Julien decided to go with the right-handed Joel Armia instead of Charles Hudon. "We knew the glove side was the place to go, and you saw our lefties go to their backhand," Julien said. "We had Hudie on our list there to go, but he was a left shot, so we opted for Armie, who has a quick release, and I thought that was going to give us the better chance." Max Domi and Jonathan Drouin each had a goal and an assist, Artturi Lehkonen also scored and Noah Juulsen added two assists. The Canadiens rallied from a 3-1 deficit after 20 minutes to win for the fifth time in the last six meetings with the Islanders. "Everybody knew we weren't as good as we can be in the first period," Armia said. "I think everybody knew that if we're going to have a chance to win this game, we're going to have to be a lot better, and I think we did a pretty good job of that." Antti Niemi started in place of Carey Price and made 21 saves before stopping all five of New York's attempts in the shootout. Montreal has won seven of 11 (7-3-1). "We are a resilient group," Domi said. "We bounced back and it was good to see. We know what it takes to win. It's fun. Winning is great. When you come back to win in another team's arena, it's even better." Casey Cizikas scored twice and Valtteri Filppula also had a goal for the Islanders, who snapped a season-high five-game winning streak. Greiss stopped 32 shots. "We were awful, plain and simple," New York coach Barry Trotz said. "The right team won tonight. That was our worst game of the year." The Islanders went on the power play with 27 seconds left in regulation when the Canadiens were caught with too many men on the ice but came up empty on the man advantage for the fourth time in the game. Trailing by two after 20 minutes, the Canadiens came out with increased intensity in the second. They outshot the Islanders 15-6 and pulled within one with a power-play goal late in the period. Domi fired a shot from the right circle that beat a screened Greiss on the goalie's blocker side with 4:24 remaining. It was Domi's eighth goal and team-leading 15th point. Montreal nearly tied it almost two minutes later on another power play, but Jeff Petry's shot hit the goalpost. The Canadiens then tied it at 7:43 of the third when Lehkonen scored on a tip in front on a long shot by Juulsen. "We had a slow start that first period and we weren't ourselves," Julien said. "We talked about what we needed to do ... and what needed to get better and I guess the guys just responded well. "That's what you need to see. Not every game is going to be perfect. How you react to certain situations is important. I thought our reaction after the first was extremely good."